Philips Zoom teeth whitening technology is an advanced technique we use here at Paul Trembath Dental in Mt Gravatt to help give our patients whiter and brighter smiles. This treatment is exceeding patients and dental professional’s expectations with its success showcased on The Today Show, Entertainment Tonight, EXTRA, Extreme Makeover and many more. 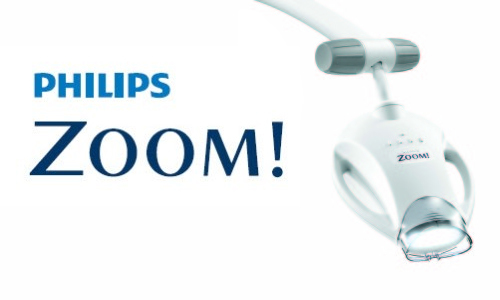 Patients can put their confidence in Philips Zoom teeth whitening technology for their teeth whitening needs. Here at Paul Trembath Dental we are using the �?Philips Zoom WhiteSpeed’ as an effective tool for whitening our patient’s teeth. Zoom WhiteSpeed is an in-office system that has a variable intensity setting,which means each treatment can be customised to maximize your comfort. The system also includes desensitisers which can help minimise sensitivity and protect your tooth enamel. This treatment, which is performed by our dental professionals here at Paul Trembath Dental, is safe, effective and clinically proven to whiten up to eight shades for a brighter, whiter smile. Not only is this innovative technology effective, but it often only takes one visit for visible results! Why should you choose a Philips Zoom teeth whitening treatment? The market is flooded with at home teeth whitening kits, and while some are effective in whitening your teeth not all are safe to use. Remember when you choose to whiten your teeth this treatment is designed to essentially bleach your teeth. By visiting our team here at Paul Trembath Dental you are ensuring that safe products are being used and that they are being applied by skilled and experienced professionals. Philips Zoom is not only proven to whiten teeth up to eight shades, it’s also safe and customised to each individual’s mouth. Why are my teeth stained to begin with? If you want a whiter smile our Philips Zoom teeth whitening technology can treat your discoloured teeth. Keeping consistent with your dental hygiene after your treatment and coming in for regular check-ups is a great way to maintain your newly whitened teeth. With our Philips Zoom teeth whitening technology we can help reduce the signs of your discoloured teeth today! For more information about our Philips Zoom teeth whitening treatment please don’t hesitate to call (07) 3849 2711 or contacts us.